Attending the Farwest Show is always a pleasure, especially visiting the new varieties on display. This year's plants are as exciting as always! PORTLAND — Be on the lookout for the blossoms of this beautiful shrub—Hydrangea macrophylla 'Horwack'—it will stop you in your tracks; at least it made me come back and look at it three times! Bred by Claus and Tonsten Kühne, Germany, for the United States, it will be brought to you by Ball Ornamentals. The mophead cluster of flowers begins its opening number festooned in chartreuse-green. As they mature, the center of each flower changes into violet red with the outside edges the same complimentary chartreuse-green. Further aging turns the blossoms completely violet-red and purple. When the shrub is in various stages of flower color it’s an eye-catching event to behold! 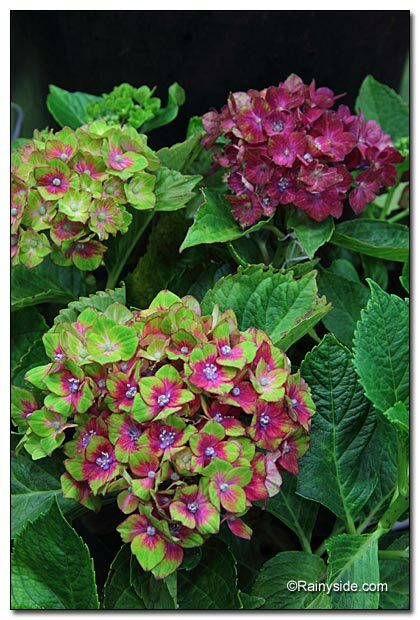 Even a small garden could fit this little three to four feet tall, by three to four feet wide gem into its borders, and its size makes this hydrangea a great choice for containers too. In addition, the mophead cluster of blossoms will look great as fresh cut flowers. I suspect that the blossoms will dry and retain their beautiful color. All mophead hydrangeas grow fantastically in the maritime Pacific Northwest. I look forward to finding this cultivar in the nursery trade and adding it to my garden. 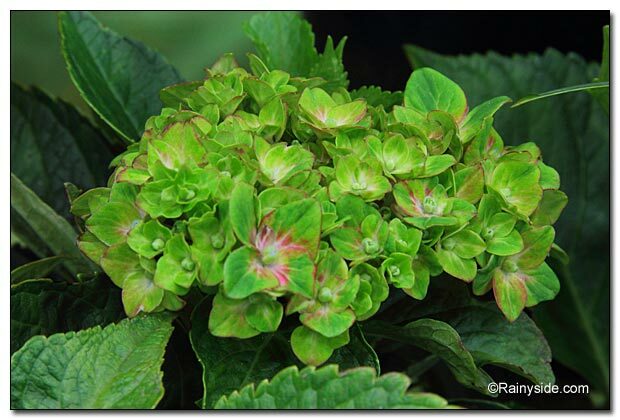 Please let me know what you think about this hydrangea in the comments below! Height: 3 to 4 feet. Width: 3 to 4 feet.